Henry didn't like being underground! Henry had an aversion of being underground ever since the collapse of the underground hut he helped to build. He was ten years old and Errol had nearly died! And then when he was at Ranger School, he couldn’t get out of the geology field trip when they all had to go underground into a coalmine ‘for the experience’. Experience was right! There was an earth tremor while they were down there, little bits of rock fell on their loose-fitting helmets and they couldn’t exit the place quick enough! Lucky it wasn’t five years later; Inagahua thirty-odd kilometres away was a major quake-site in 1968! Anyway… Still at Reefton up on Holmes Hill, he fell down a forty foot vertical shaft while cutting a line through bracken fern. Usually there’s a warning that there’s a shaft, because they’re full of black water, his was probably the only dry one in the whole area! And they reckoned he was lucky! He was well aware that there were coalmines on Diamond Hill because of the access track to the old hut that had served as the mine office. 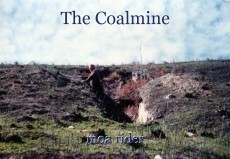 The piles of dross around, were a dead give-away that there was coal, but it was a low grade of lignite. They needed to form a road around the hill for access to facilitate land preparation and planting but Henry was a bit windy about traipsing through the gorse to survey the line in case he fell down shaft like he had at Reefton! The mines office were not much help because they were moving to another building, so all their files were packed up in boxes. They were able to say there were thirty two shafts in the hill, but couldn’t identify their location without the records! Mick was driving the dozer to roughly scrape out the roadline, and Henry sat on the armrest with his abney level to keep him on a good grade, and to keep an eye out for any big holes. Half an hour in, whap! The right hand track flopped down a narrow mineshaft, luckily, the dozer couldn’t fall right in, the shaft was only wide enough to push a trolley down. However the dozer reared up like Trigger and was stuck there at half-mast! Mick jumped off like lightning to roll a smoke! Henry and a team dug in a dead man as an anchor for the winch, the only way available to rescue the dozer. A dead man is dropped into a slit trench, four or five feet deep. The dead man is a stout log wedged in the bottom of the trench. The dozer dragged itself out easily enough but they had to do the same thing three more times! None were over-dangerous, but Henry and co could have done without all the digging, it was pick and crowbar stuff, hard as the hobs of hell! There was a swampy area where water seeped out of the main shaft and they knew to drive in there would risk the dozer becoming properly bogged. So while Mick pushed up a heap of dry clay, Henry and his team dug a trench through the bluish pug and laid culvert pipes. They then cut Manuka poles to lay down over the mouth of the pipe, so the clay fill didn’t block the entrance of it. On top of the swamp and the covered-in culvert pipes, they laid a thick layer of branches, slash and small logs. The technique is called fascining. Mick then covered the fascining with the stockpiled clay and they completed the road with no further out-of-the-ordinary issues. Henry knew about the other, more substantial shaft on the other side of the ridge, because at times water from it flowed onto Rodman Road and they had to make repairs. Under a new policy, the forest had an open gate policy and 1% of its annual spending vote was set aside for ‘amenity’ work or plantings. The walking tracks and the picnic area down at forest HQ were already being well utilised. Hooks, had always been interested in mines and he nagged at Henry to at least drain the Rodman Road mine to see what happened, with the idea of it being of public interest. In the end Henry acquiesced, so one day they took shovels and dug out the entrance. Whoosh! Water gushed out, washing the road away, causing so much damage to the road that they had to close it while repairs were made! With the road fixed, Hooks, like a foxy with a bone, nagged again at Henry, this time to enter the mine! Henry knew it would come to that! But he wanted some assurance that it was safe, and they both knew the last manager from the Shag Point mine, so they went to see him. He should know what was what because one of his shafts used to go down under the sea. They could hear boats passing above them – how freaky is that? Anyway, he advised them that it was safest to take a candle and if it goes out, get out quick! They came away with Henry realising they didn’t ask how you know the bloody thing wasn’t going to cave in! The shaft went into the hill about level, but ten or fifteen metres in, the candle went out! They made a hasty retreat, about as hasty as you can get! Safely out, Hooks claimed it was a drop of water that had extinguished the candle, he was holding it, so he should know. He wanted to give it another try but Henry asserted it was too dangerous and decided to seal up the entrance – no argument. Hooks was disappointed. Fooling with sanity, and because history is history, Henry took a team to clear the scrub and make a walking track to the mine entrance. He decided he wasn’t going to give in to fear, so he told Hooks to bring his candle. This time Henry was going to hold it and he had made a holder out of a tin can to protect the candle from overhead drips. Deeper than the first time, the shaft climbed slightly into the hill. As they progressed, Henry kept looking back to that ever decreasing circle of daylight. About thirty meters in, the shaft divided sharply, so they decided to follow the left fork, which circled into the hill for maybe twenty metres to where there had been a rock-fall and their way was blocked. The daylight circle had disappeared and Henry felt a strong urge run! They retraced their steps back to the fork, and Henry was grateful to see the circle of the entranceway. They progressed up the right-hand fork. Suddenly goose bumps covered Henry’s flesh and his hackles rose! In the dim candlelight, they could make out someone standing at the base of another rock-fall! The last miner in there must have stood his shovel upright, fashioned a cross with a stick to hang an old coat on. He had then placed a dead man’s hat on top – in the half-light it looked for all the world to be a real person standing guard! And yes, when the mines records were available they did say that someone had been lost in the rock-fall! They decided to close off access into the mine. This kept me glued to the screen, Moa... Excellent. Poor Henry, having to go back underground after that first experience. Well told, Moa, and what a creepy sight that must have been.